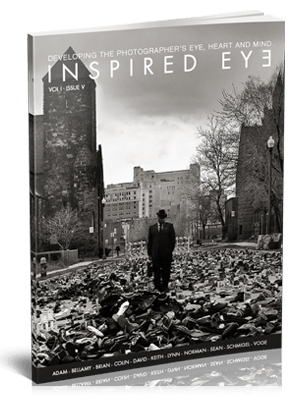 Inspired Eye Photography magazine exists to showcase the work of the photography community, to learn, to teach, to inspire and to be inspired from it. Every issue of Inspired Eye is an adventure in Photography. Life is in color, and while Street Photography is heavy in monochrome, this 20th issue of Inspired Eye celebrates both. In it you will discover the neon art of Jane Gottlieb that pushes the boundaries of what a photograph is. Michael Sweet seeks for a unique style in LO-Fi street images, while other shooters like Eric Kaufman shoot Vietnam with muted colors. Honoring the Black and white tradition, we have Des Byrne who seeks deep contrasty scenes, and Jean Michel Voge who has a large essay on Semana Santa in Ibiza. Read the magazine and gain collective wisdom from a variety of photographers from New York to India. This edition is 273 pages (137 spreads) that are beautifully laid out, this issue of Inspired eye will enrich your photography. Get a subscription, you save on 2 issues!